Mars Petcare leadership team builds relationships and collaborates during GeoTrek. Arguably one of the most beautiful cities in the world, San Francisco offers innumerable team building activities for your corporate group. 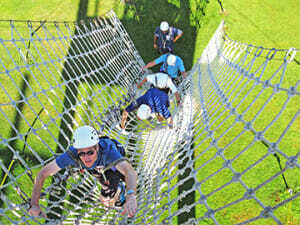 Some of the most fun and exciting activities take place in and around the city’s numerous landmarks. We at Adventure Associates know San Francisco inside and out, and can assure that you and your team experience a fun and professional event, regardless of the activities you choose. With a moniker like City by the Bay, it’s not surprising that this is one of our most popular team building events. Iconic landmarks will dot your maritime journey throughout the bay. Corporate teams must work together to navigate their ships past the massive Golden Gate bridge as cars and tourists make their way across. Likewise, you’ll be weaving around the man-made Treasure Island and the newly built Bay-Bridge while replaying scenes from The Rock in your head as the bay breezes blow you past Alcatraz. San Francisco’s famous skyline is an ever-present backdrop, with the iconic, triangular Trans-America building shooting off into the sky. With 24-36 foot boats accommodating groups of four-to-six participants, your team will share various responsibilities while becoming better acquainted with each others learning styles. Depending on the weather conditions, either a regatta or time-trial style expedition will add a fun and competitive element to the outing. If water isn’t your thing, GeoTrekking offers an amazing opportunity to see San Francisco’s landmarks by foot. A hybridization of the popular sport of geocaching, with a pinch of scavenger hunt thrown in, this event will have your company’s teams enjoying the views from the Ferry Building or Ghirardelli Square while looking for specific caches or other San Francisco landmarks in a group competition. Fast-paced and exciting, this activity is a hit with San Francisco natives and visitors alike, enabling you to have fun solving team challenges while seeing parts of the city you might not have otherwise. If you and your team are up for a little adventure, then you might want to try one of our ropes courses in San Francisco. We can facilitate half or full day exercises at a beautiful ropes course near the Cliff House overlooking the Pacific Ocean, just west of San Francisco’s historic Presidio. We strap you up with harnesses and pop a helmet on your head, and then get you passing from tree to tree in exciting and energizing high activities that involve the whole team. The finale of this ropes course is an exciting activity called The Perch, wherein you jump from the top of a telephone pole towards a trapeze or another object that you try and hit with your hand. All our activities are challenge-by-choice, so no one is obligated to do any of the exercises. Whether participating in a specific challenge or just cheering others on, everyone will still has a great time. If heights aren’t a great fit for your corporate group, or you’d like something a little less adventurous, we also have a low ropes course option wherein most of the challenges occur at at or just above ground level. The various challenges encourage support and communication amongst your corporate team and will build lasting memories for all those involved as you tackle activities like The Web, getting participants through a rope webbing without touching any of the ropes. We’ve got tons of other options for your corporate group, such as our fun and competitive Pursuit and Team Performance challenges, which include exciting team challenges. They’re great in both indoor conference room settings or in hotels, but they’re equally perfect for the outdoors. Imagine soaking up the sun in the expansive Golden Gate Park while competing in a number of physical and mental group challenges. Try one of our most unique programs, Zoolutions, at the famous San Francisco Zoo. In this fun event your team will be tasked with creating a brand new exhibit. By first exploring the San Francisco Zoo, teams will perform research and development tasks in order to better understand the workings or the zoo. Presentations occur at the end and a finalist is selected. Problem-solving and teamwork skills are tested in this fun and unique program. Whether you’re looking for indoor activities or outdoor, there are numerous options in San Francisco. The expansive Golden Gate park is an excellent outdoor venue for team building activities, as the scenery is beautiful and there’s tons of space to play. Likewise, our team events are equally at home in places like Ft. Mason’s Conference Center or the beautiful Hyatt Regency in the Embarcadero, which features a seventeen-story atrium. We can quite literally take our portable programs anywhere you choose. We’ve been running events in San Francisco for over 20 years and have accumulated lots of glowing testimonials from our clients. Our professional facilitators ensure every program goes off without a hitch. Get in touch with us today to see how we can make your next team building event a success.